Leeds United’s 57-year wait for a win at Brentford goes on after two late goals saw them suffer a 3-1 defeat at Griffin Park. Thomas Christiansen’s men created more chances than they have of late, but paid the price for two goalkeeping errors by Andy Lonergan and Brentford could have scored more goals, including missing a first half penalty. Ezgjan Alioski’s goal, also resulting from a goalkeeping error by home keeper Daniel Bentley, threatened to give United a point only for two goals in the last five minutes to condemn them to their seventh loss in eight matches. They are now down in tenth place and with games to come against Middlesbrough, Wolves and Aston Villa it is going to take an astonishing turnaround to save their season. Brentford started brightly with seemingly a shoot on sight policy as several shots went wide from distance with Yoann Barbet going closest from a free-kick on the edge of the box. Watkins brought the first save out of Whites keeper Andy Lonergan with a well struck shot from the angle of the box before Leeds managed their first effort, Alioski seeing a first time volley saved by home keeper Bentley. The hosts went ahead on 22 minutes when Yoann Barbet’s harmless looking cross was dropped by Lonergan straight to Neal Maupay, who netted from close range. Leeds dug in and could have levelled as Pierre-Michael Lasogga ran onto a long clearance by Lonergan and with only Bentley to beat he sent a lob over the crossbar. But they breathed a huge sigh of relief just before the break as Pontus Jansson mistimed his challenge on Maupay and tripped the home striker. Referee Stuart Attwell pointed to the spot only for Watkins to blaze his penalty over. United went down the other end and Samuel Saiz, who looked a bit lost at times on the left flank, saw a 20-yard shot saved. Saiz was switched to his more familiar number 10 role in the second half with Kemar Roofe and Pablo Hernandez sent on as substitutes for the disappointing Lasogga and Eunan O’Kane. Leeds improved and Alioski headed over, but Brentford were still dangerous as Nico Yennaris saw a 20-yard shot saved and Maupay could not get a shot on target stretching to reach a low cross. Roofe’s weak header was easily saved before Watkins hit the crossbar with an angled shot that beat Lonergan. With the action hotting up Ronaldo Vieira saw a shot from 25 yards out superbly tipped over by Bentley. The Brentford keeper then went from hero to villain as he flapped at a Gaetano Berardi cross and Alioski headed home an equaliser. 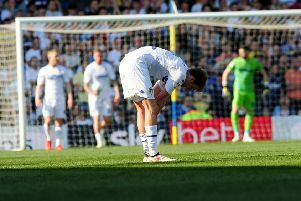 Suddenly United were playing as they can as Saiz hit a 20-yarder just wide, Roofe sent a header straight at the keeper from a Hernandez cross and Liam Cooper somehow failed to make contact with the ball after getting free to meet an Alioski free-kick. Vieira’s shot from range was deflected and saved, but Brentford’s Yennaris saw a dipping 25-yard shot hit the crossbar as both sides went for the win. It was Brentford who did score a second goal five minutes from time when Barbet’s low angled free-kick went under Lonergan and ended up in the back of the net. Leeds should have still earned a point in injury-time as Luke Ayling glanced a header wide after getting free in the box to meet Hernandez’s cross. But in the last minute it was the hosts who sealed victory as Ryan Woods calmly passed the ball into the net from the edge of the box. Brentford: Bentley, Clarke, Egan, Bjelland (Mepham 45), Barbet; Woods, Yennaris, Sawyers (Mokotjo 73), Jozefzoon, Watkins, Maupay (Vibe 80). Leeds: Lonergan, Ayling, Jansson, Cooper, Berardi, Alioski (Grot 80), Vieira, O’Kane (Hernandez 45), Phillips, Saiz, Lasogga (Roofe 45).